Another short hint about a recently published article of mine. 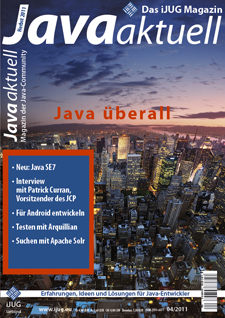 The German iJUG Magazin called "Java Aktuell" is available since 1st of September and you can read all about the new Java 7 release. If you like, you can check out some other articles of mine. Some of them done in English, too, you just search this blog for posts, labeled "article" and you get some results. The green light was on 28.07. The long wait for the new Java came to an end. After more than four and a half years, the Java community is celebrating the beginning of a comeback to modernize the language.